One life will make the difference.” Macey Holsinger has been hearing that promise her whole life. But it hasn’t saved anyone yet, not even her little brother. (5 stars) Macey is in the 10th grade and interested in arts. She also gets into trouble with her art teacher for thinking outside of the box. A fellow student brings up a question about a picture in history class. That object was a flag which no one recognizes. An interesting portion of the story develops after that discovery by Macey. The disease claims 75% of those left in the country. And, there isn’t any known cure. The ruling authority has set up a system in which everyone must go and endure experiments at set intervals in the Facility. This system lasts until you reach the age of 60 (if you make it that long). This story caught my attention because the teenagers are forced to grow up too soon. Most have lost at least one in their family while some have lost both of their parents. It illustrates rebellion, compassion. love for family and friends and life complete with its ups and downs. The characters are well defined, plot is excellent and the ending is super. I did have to think about the ending for awhile after I finished reading it. I figured out that it offers hope for one of the main characters and it really is a perfect ending. 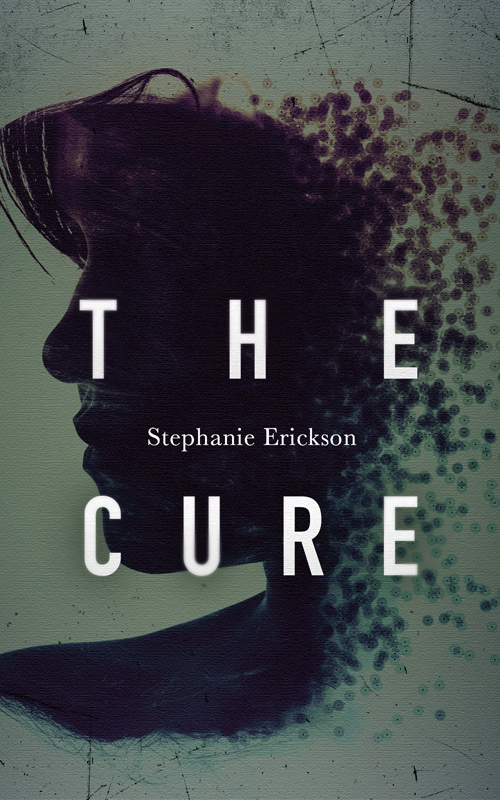 (5 stars) The Cure is a gripping story of a girl in a future society where the population has been severely cut down by an incurable disease. The people must subject themselves to horrifying experiments for the ‘greater good’ to find a cure. The outspoken Macey is trapped and limited by the government and begins to question the way things have been for years. She is surrounded by suffering, loss and clings tightly to her diminishing family and friends for strength. Macey’s one creative outlet – art – becomes censored after she paints old symbols that are forbidden for unknown reasons to her. Stephanie Erickson has created an incredibly well rounded character in Macey – a young woman who is facing a very controlled future – who instead of submitting to the government like everyone else begins to challenge the justness of her world and make her own path, for however long she can. The society Erickson has built is fascinating and the suspense level is high throughout the entire novel. The ending is extremely well done and thought provoking. The character of Macey develops from a rebellious argumentative girl to a incredibly brave woman who is forced to make decisions that could change everything. The Cure captured my attention and I couldn’t put it down – to the point where I stayed up all night to finish. It is a must read from a brilliant young author. (5 Stars) Stephanie Erickson’s second novel is a natural for the Teen – Young Adult Market. I’m not in either category, but I couldn’t put it down until the end. I loved it. Set 100 years in the future, it is the well told story of a perky, young high school Junior, Macey, struggling to maintain her creativity and independence and make sense of the world around her. It is a restricted society in which Every citizen is given a personal examination “date” by the “State” in an effort to attain a cure for a killer disease that afflicts the world.The examination itself can be fatal. When she turns 18 Macey is scheduled for her turn. And guess what happens? Erickson maintains a steady, consistently controlled dramatic pace throughout. The result is a thoroughly refreshing reading experience.. an original concept delivered with a realistic and consistent voice. Congratulations to this young novelist!. (5 Stars) I have read Erickson’s first book, the Blackout which I enjoyed. However, with the Cure she has taken her level up several notches in my opinion. The story about Macey and the choices she must face, the grief she must deal with, and the unfairness that is levelled at her was a great blend and handed me, the reader, suspense, emotion and the inability to put the book down. Everything about this story tugged at me, and was reminiscent in some ways of Margaret Attwoods, The Handmaids Tale, in that there is a plausibility to the story that was undeniable, and the reality of a government doing whatever they wanted for the greater good. Loved the ending, loved how Erickson pulled it off so that it was strong ending, even if still emotional. Looking forward to her next work!